The 89th ARBA Convention at Wichita, Kansas has just concluded. Technology has made it possible for us living near and far to get almost instant updates on all that was happening which made it more bearable not being there in person. I am sure the feeling of being present on location is very much different from looking at photos and watching videos. Certain things like the intensity, energy and massiveness of such an event can only be felt on the ground. Though I have made a promise to myself to try and attend the ARBA Convention yearly with the sole intention of visiting my beloved bunny friends, God had a different plan for me this year. I was blessed with the opportunity to briefly visit 3 different states in the USA and one of which is one of the 7 wonders of the world. Until today, I am still awestruck by how massive it is and its energy is beyond the imagination. Photos are unable to describe how majestic this place is. 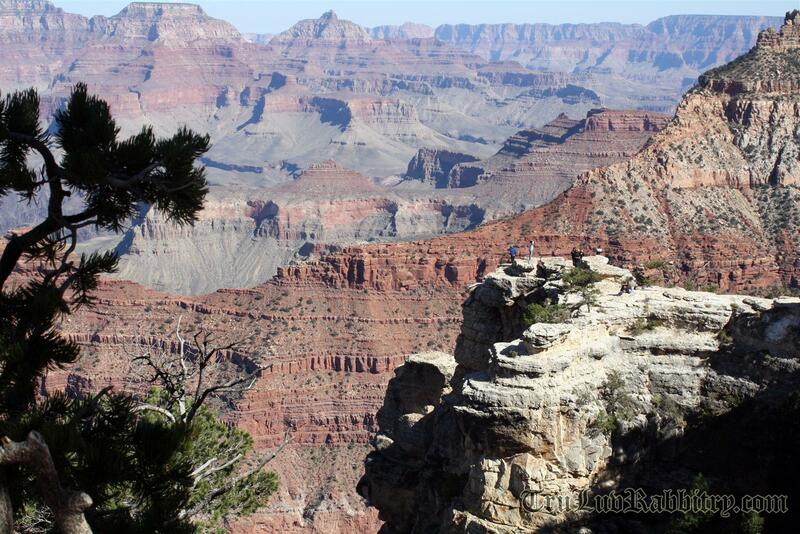 The size of the people on the edge only shows how huge this small section is. 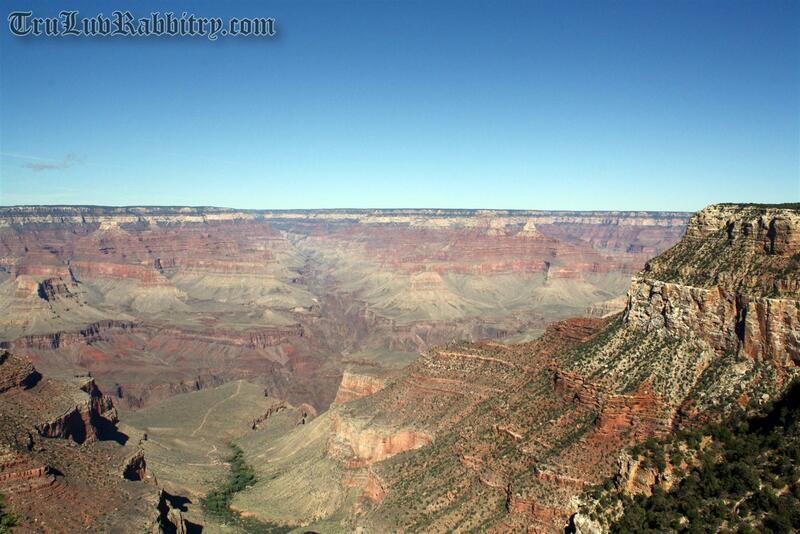 This is but only a very small part of The Grand Canyon. It really feels like I was at the top of the world and the feeling is impossible to describe, simply out of this world. 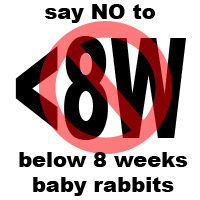 And that was one of the things I was preoccupied with when most rabbit breeders were busy preparing for Convention. Nice as it may seems, there were hard work involved in everything and in everything there is a price. That brings me to the next part of the intention of this post. I have known the wonderful family over at the Three Little Ladies Rabbitry since the initial days of my rabbit raising journey. Though younger, the girls have been raising rabbits (seriously) for much longer than me and their collective years of experience surpasses me by many miles. After such a long time, their hard work finally paid off at this year’s Convention when one of their Jersey Woolly rabbits was crowned Best Of Breed in Open. Their win inspires me as it is a good testimony of how hard work and perseverance can bring about sweet victory. I can always remember that tiny little girl holding one of her rabbits in that news article and I am sure that little girl has grown to be much taller than I am. Congratulations to the Usakowski family especially Taylor & Jessica! 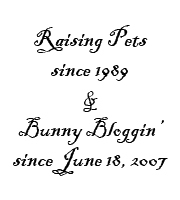 Tru-Luv Rabbitry is being featured on one of the most visited rabbitry weblogs in the rabbit world (in my opinion) – the Three Little Ladies Rabbitry. Who would have thought? I felt that I have came full circle in this hobby because I started off the hobby learning and reading from this weblog. To describe my feeling – Charice sharing the stage with Celine Dion! As you can see, I do not write that well as compared to Three Little Ladies Rabbitry because I may tend to ramble and grumble a lot. I guess when you are fired up in the hobby, words are the best way to express oneself (for me at least). I want to thank Rob, Cathie, Taylor, Jessica & Ashleigh for this feature. Through the years I have seen how the three little young ladies grow and mature in the hobby. Your family is truly an inspiration for me. Thank you very much for the friendship. I feel the need to mention 2 families that raises Holland Lops and I hold extremely close to my heart. Being a family oriented person, I feel proud and honored to know these 2 families. They are some of the nicest Holland Lop breeders that has inspired me in both raising rabbits and also as role models in raising children. The first family that I would love to mention is the Usakowski family. I first knew about them when I stumbled upon their wonderful website and blog at http://threelittleladiesrabbitry.com/. Their blog is phenomenal and mine is nothing compared to theirs. And as you can see, the rabbitry is named after the 3 daughters in this family. The three girls are award winners in the 4-H program for showmanship. Their rabbits has been doing very well on the show table as well. If you remember, I did wrote about their youngest daughter Taylor and how she should be a role model for all children in the hobby of raising rabbits. I am extremely honored to have known this wonderful family. They are always there giving me great advice and encouragements. I want to take this opportunity to thank the 4 wonderful ladies and 1 very kind man of Three Little Ladies Rabbitry, collectively known as the Usakowski family. The 2nd family that I am extreme honored to know is the Butler family from Michigan. Like the Usakowski family, they also raise Holland Lops. Harley and Raven are two beautiful daughters to Sydney who together do most of the bunny chores at Butler Boot Camp rabbitry. I particularly like the styles in Harley’s Holland Lop herd which hails from different competitive lines in the area they live in. There are so many things in common between these 2 families but one major issue that I find very appalling and disappointed is the need for the parents to shield their children from very nasty people (adults!). There is a saying that goes “Live and Let Live”. What the saying means to me personally is that it simply tells us to give someone else a lifeline and in return we are given ours as well. How many times do we find ourselves caught up in the “CULTURE OF DEATH”? We want so much for others to die and be unsuccessful, and in doing so, we tend to cut off someone’s lifeline. I can understand how nasty things can happen between adults but some adults don’t even give children the chance to shine. How selfish is that? There is only 1 reason to act nasty in the midst of competitiveness. It is for recognition that could lead to someone being able to earn tons of money riding on the recognition. I totally don’t believe in that bull crap although I just wrote it. But do not be surprise why people “slit throats” at rabbit shows for that reason. It does get to that level believe it or not (although this is not Ripley’s). Life is so much bigger than all the trophies one can collect. I have reasons to believe that nasty people are highly insecure people. They have a facade. Their facade is in their rabbits. They hide behind the rabbits and trophies obtained through their rabbits. And that seemed to mean the world to them. What is the rational in that I wonder as I just can’t find the relevance sometimes. A facade will never ever reflect the true person we are. I know we tend to suppress our conscience to get away with things or even to achieve our selfish desires by cutting edges. If that is what we need to do, the least we could do is to leave the children out of it. If you are an adult without the presence of a conscience and as I feel sorry for you, I urge you to go pick on someone your own age if you are that childish and such a sore loser amidst the competition. I pray that God will have mercy on your sold out soul. Let’s quit targeting gracious parents that spend most of their time/hard work nurturing their children the best they can by conveniently passing remarks such as them using their children to gain glory off a few trophies and titles. Glory is only made for God mind you! And as for all families raising the Holland Lops, keep up the great job!